Our shredded beef burrito is muy bueno. Flavorful roast beef combined with just the right amount of salsa spices creates a truly authentic taste that will please the meat lovers in your family. A hearty lunch or snack with only 180 calories and 4 grams of fat make this delicious burrito the perfect, good sense choice. Enjoy it as is or dress it up with your favorite salsa, guacamole or sour cream. 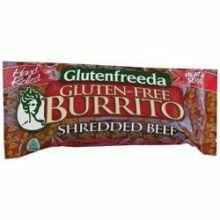 If you have any questions about this product by Glutenfreeda's, contact us by completing and submitting the form below. If you are looking for a specif part number, please include it with your message.